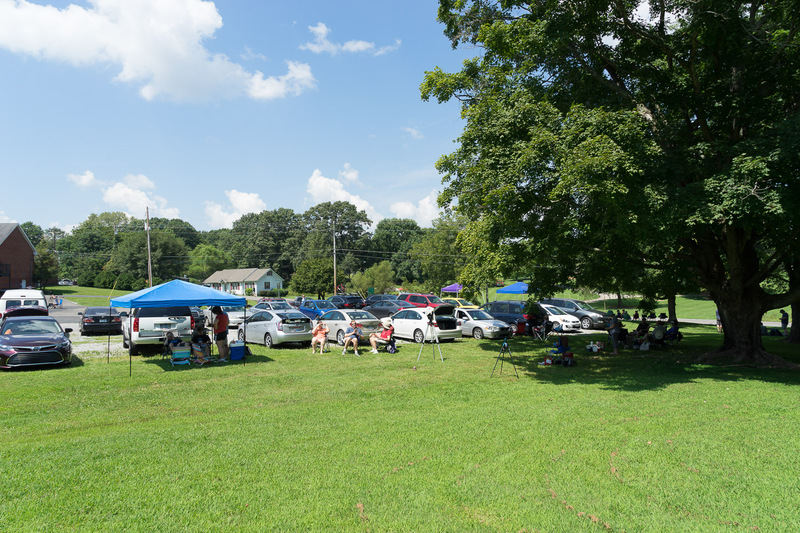 I watched the total eclipse of the sun with about 20 or 30 other people from behind Birdwell's Chapel Church of Christ between Cottontown and Cross Plains, Tennessee (right here). The drive to my hotel on Sunday took significantly longer than I expected due to construction on the I-75 bridge over the Ohio River and more construction in Elizabethtown, Kentucky, but I pulled in around 7:30 PM CDT after a 12-hour drive. In the morning I went to the site I'd selected from Google Maps satellite views, but found deep drainage ditches on either side of the road which I didn't notice on the images, but that prevented me from watching from there. 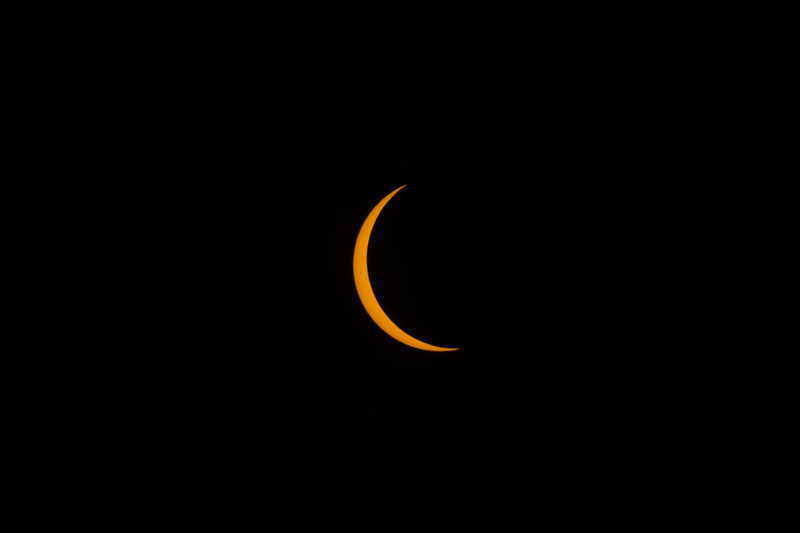 Instead I went to the church across the street from my breakfast restaurant, about 1/4 mile north of the centerline of the eclipse -- plenty good enough. Plus there was a small group of people at this spot, which made the 2.5 hour wait for totality much more enjoyable. Below is a poor photo of about half of the people with whom I watched the eclipse. My blue camera tripod is in the sunshine, just left of the tree. My chair is nearby in the shade. It was very hot. 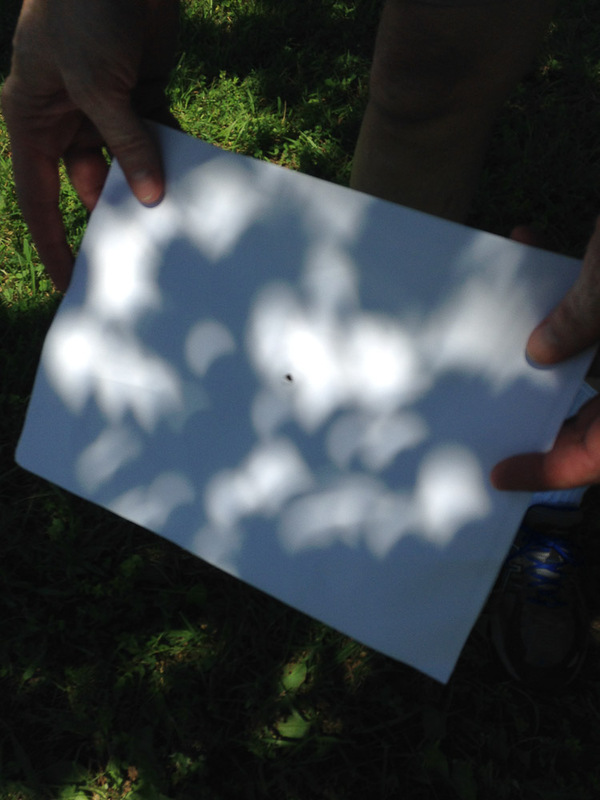 The eclipse began when the moon first covered the slightest upper-right edge of the sun. (Click this image and all others to zoom in, click again to return). 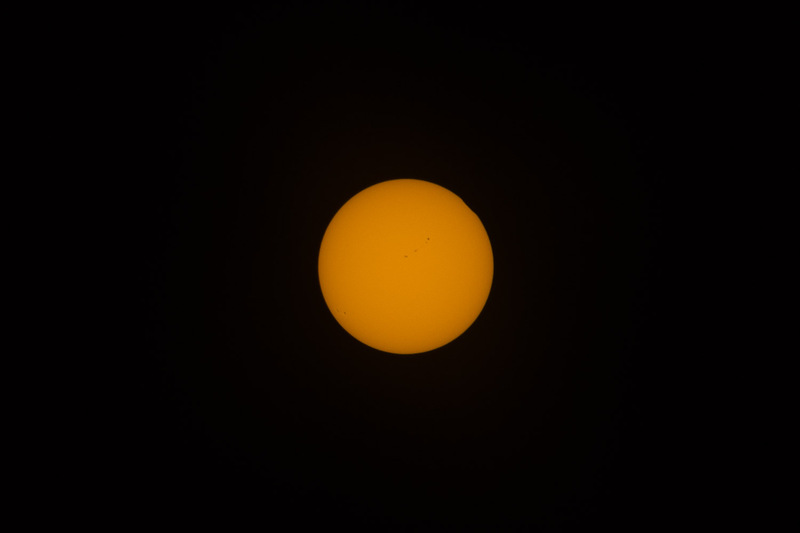 Notice the line of sunspots above-right the center, and the two sunspots at lower-left. Each of these individual spots marks a magnetic storm on the surface of the sun which is larger than the Earth. They're dark because the surface is cooler there. As the sun rotates once each 28 days, you can watch the sunspots move across the surface (it takes about 14 days), though they can drift a bit complicating things. 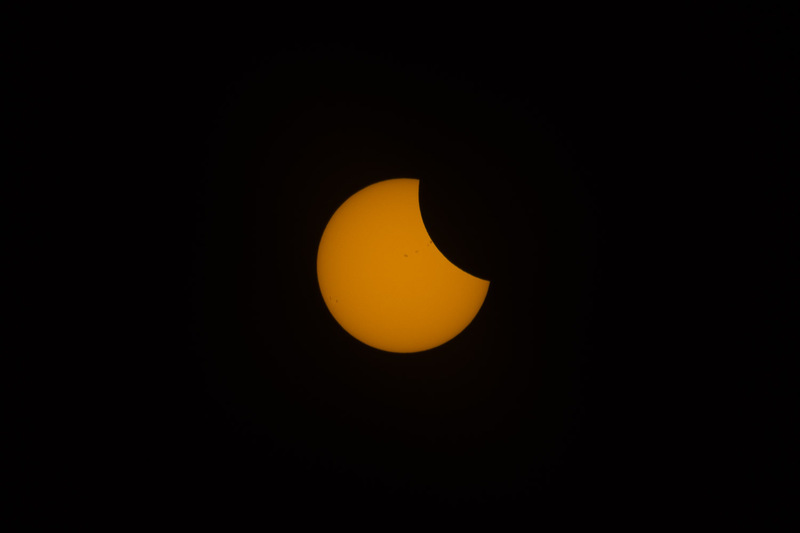 The partial phases of the eclipse progressed over the next 90 minutes as the moon covered the sun. Once the sun was about half covered, it was noticably darker, and it was a very strange darkness since the sky was bright, not like sunset, but the ground was more like twilight. We also had fun watching the sunlight filtering through the tree onto the ground. 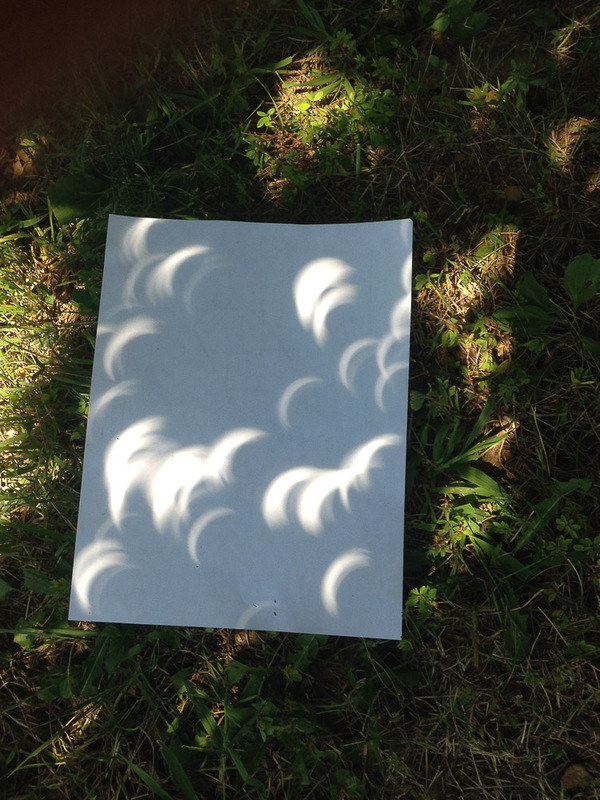 Each gap between the leaves acted like a pinhole camera and projected an image of the crescent sun onto the ground. A piece of paper on the ground made those overlapping images appear easily. One woman's straw hat, with it's hundred tiny holes, did a better job than the tree, but I didn't take a photo. 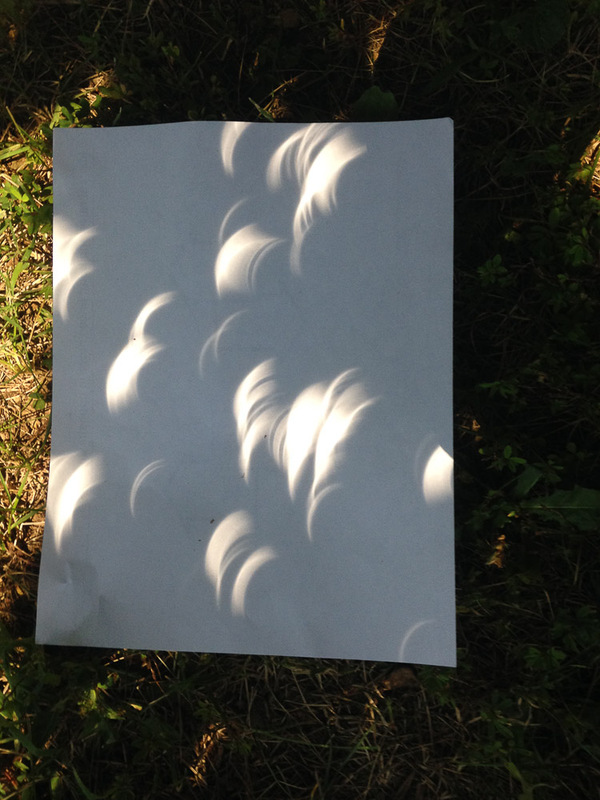 The 3 iPhone photos below show the effect on paper at approximately the three stages of the eclipse shown in the above 3 photos. As darkness approached, crickets and birds went crazy chirping. Then all of the sudden it happened and some of the quickest 2-1/2 minutes of my life began. As I remember things, the crickets and birds stopped talking quite quickly, but the humans were cheering and shouting. The moon covered the last piece of the sun, forming a brilliant diamond ring in the sky for the briefest flashing instant. This happens when the sun is covered enough that the faint corona around the sun appears, forming a ring, but the smallest spot of uncovered solar surface still shows. At this point I was in watch-the-eclipse mode so I wouldn't miss anything fumbling with a camera, so I have no photo of this. This youtube video shows the diamond ring effect at the end of the eclipse, 150-seconds after the point I'm describing, but run it in reverse in your mind and you'll understand what I'm talking about. After staring dumbstuck for maybe 10 or 20 seconds (this is a truly overwhelming sight - you must experience it if you haven't - words cannot describe it) I took the filter off the front of my camera and snapped the series of photos that I'd practiced many times, just by touch, while watching the eclipse and not looking at my camera except an occasional glance. All of these photos are slightly out-of-focus, I assume this mistake happened when I pulled off the filter. Oh well, here they are anyhow. Search the internet, it'll be trivially easy to find better photos. The first is a very short exposure intended to show the lower atmosphere of the sun just above the surface. This is not what the eclipse looked like to the naked eye (we'll get to that later). You should be able to see the beginnings of the white circle of atmosphere around the sun, called the corona. It looks a little like hundreds of rays shooting out from the surface, and is normally totally invisible since it's overwhelmed by the intense brightness of the sun's surface. 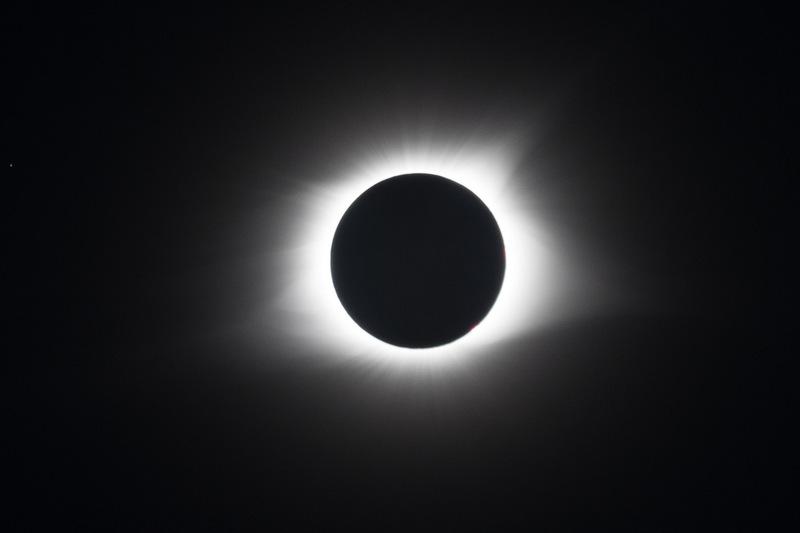 Seeing the corona is perhaps the number one reason to go to a total solar eclipse; it is awe-inspiring. Perhaps equally interesting are the red blotches at 3 o'clock and 5 o'clock. Those are solar prominences, which are streamers of sun-stuff being ejected upward from the sun's surface, maybe something like a spewing volcano on earth, but caused by a different effect and much much larger. A slightly longer exposure shows the inner corona perhaps too brightly, begins to show it further out from the surface, and is probably my best photo of the set for the prominences. You can see that the one at 3 o'clock is a loop prominence, being thrown off the surface, the pulled back down to the surface by the relentless gravitational pull of the massive sun. I think the sun-stuff follows a magnetic field line, and that the prominences have something to do with sunspots. This next one is a longer-still exposure, and begins to approximate what you see with your naked eye, with the extreme caveats I'll get to shortly. Finally this next one is my longest usable exposure (the ones beyond this are just trash). The fainter outer parts of the corona are now visible, at the expense of burning out the inner corona and the prominences. 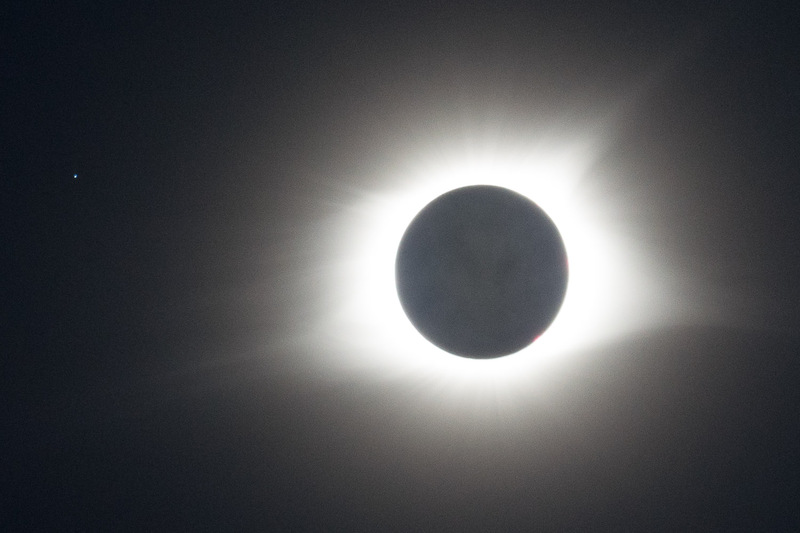 I've cropped this photo with the sun off-center here in order to show the brightest star that was near the sun for this eclipse, named Regulus, in the constellation of Leo the Lion, which was visible to the sun's left to the naked eye. This star was quite close to the sun; the planet Mercury was further to the left, and Venus was farther still to the sun's right. 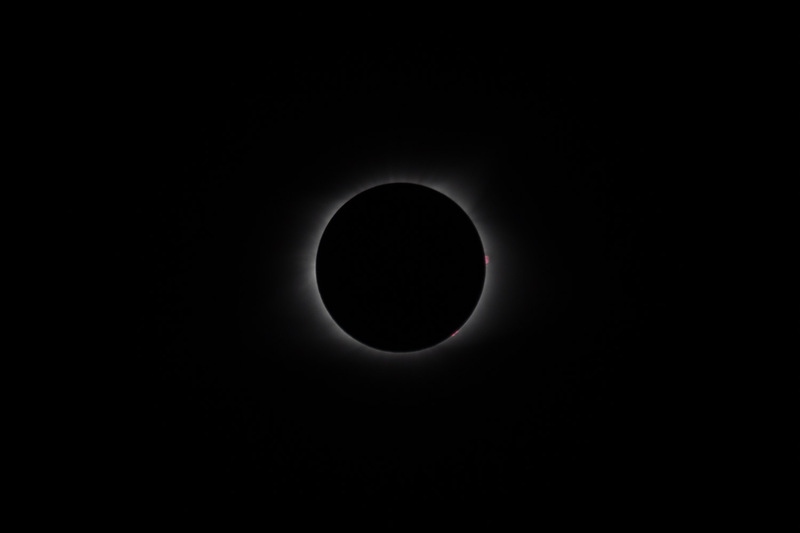 Much quicker than I was ready for, the diamond ring re-appeared on the opposite side of the sun as the moon began uncovering the sun's surface, daylight came back, and people cheered again, but I didn't feel like cheering because it was now all over. The sun was back, the once-in-my-lifetime-moment (thus far) was finished. OK, so now, here's what the eclipse looked like to my eyes. Take all of these photos and merge them in your head, such that you can see the faintest pieces of each photo but all in one shot and all at the same time, with nothing burned out as in these photos. The eye is a remarkable camera, allowing us to see faint and bright things at the same time, unlike my camera (or perhaps its operator). This is about what the eclipse looked like to me (except it was in focus). Even this description isn't entirely accurate, though, because the corona, to my eyes and to binoculars, is made of myriad threads of silk emanating from the sun. Part of this lack in the photos is certainly because they're out of focus, but I suspect that even in focus this fine detail would not show as well as my eyes could see. It's not a white blotch like these photos show, but a highly-detailed intricately-structured ring of light around the sun which is never visible except during the briefest, fastest-moving minutes of a total solar eclipse. This photo by someone else shows it quite accurately. If you ever get a chance to see one (April 8, 2024), you should do everything you can to see it. This was my first total eclipse, and being an amateur astronomer I've heard all my life how wonderful they are to see. But that's not accurate, they're much better than that. Nothing could have prepared me for what I actually saw. I've heard again and again that once you see a total eclipse, you'll want to see another and another. I believe this was the first total eclipse for everyone I observed with, and everyone, without fail, talked about 2024 before we dispersed. Reality came back quite quickly once totality ended. My wife is in serious back pain, especially first thing in the morning. She's having her sixth back surgery on Friday. Friends helped her Sunday night / Monday morning so I could go to the eclipse (how selfish of me), but Tuesday morning is up to me. I left the eclipse right away, and travelled to a distance of what should have been 2 hours during the first 5 hours of intense traffic-jam driving. After that for the next couple of hours, it was a constant ribbon of red tail lights in both lanes of I-71 northbound, usually difficult or impossible to switch lanes, with practically no headlights on the other side of the freeway. Traffic jams stopped the freeway completely a few times, sometimes for construction, once for an accident, often for no apparent reason. I reached as far as Dayton Ohio before I had to stop to sleep for a while at 11PM. I set my iPhone alarm for 2AM, fell asleep for about 1/2 hour (I'd had lots of caffeine), and woke up to drive the rest of the way home, which I reached at about 5:30 AM, in time to help my wife. Would I do it all again? Absolutely. But maybe next time (remember, that's on April 8, 2024) I'll sleep that night near the eclipse and drive home the next day.